Categories are a way to personalize each newsletter based on the subscriber's interests. Subscribers will be able to select categories that both interest them and not interest them at all when they personalize. 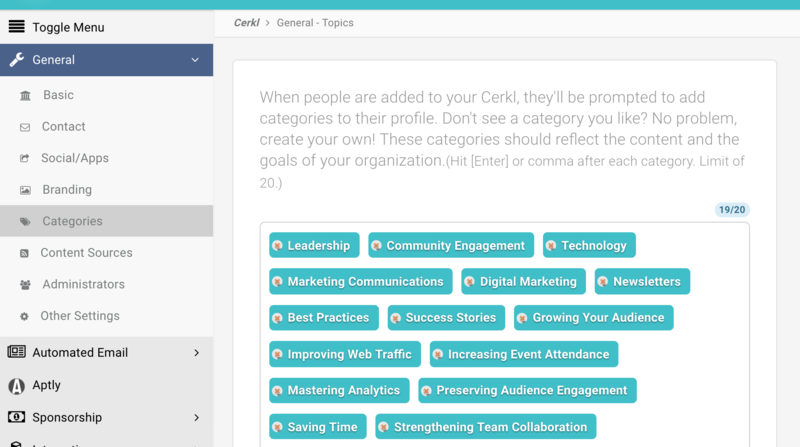 Interested in some Cerkl pro tips on creating Categories? Click here. You can access Categories by selecting Settings > General > Categories. Subscribers also have the option to explicitly add their own interests when personalizing. You can see your subscribers selected categories and written interests under Manage Subscriber > Subscribers. The more users sharing the same interests, it may appear under Category Opportunities, which can be found under Insights > Categories > Category Opportunities. It is beneficial to observe these Category Opportunities so that you can better understand and engage your subscribers. For more information on the Categories Tab in Insights, click here.